Do you have a photograph or painting that you love? If you’d like to copy the color palette so that you can 1) paint your living room to match 2) create a digital drawing or 3) design a web page color scheme around it, then the Color Palette Generator is the tool for you. 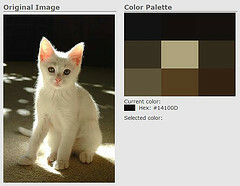 You upload a photo and get a simple break down of the color palette, complete with HTML color codes. It’s easy breezy to use and fun, even if you have no plans to bust out a paint brush in the near future! This entry was posted in generators, photos and tagged art, gadgets, photos by Lilli Day aka bookbabie. Bookmark the permalink. That is one cute kitty. I love the soft sun light. What a great sage like expression.